Weaving with kids is so much fun! 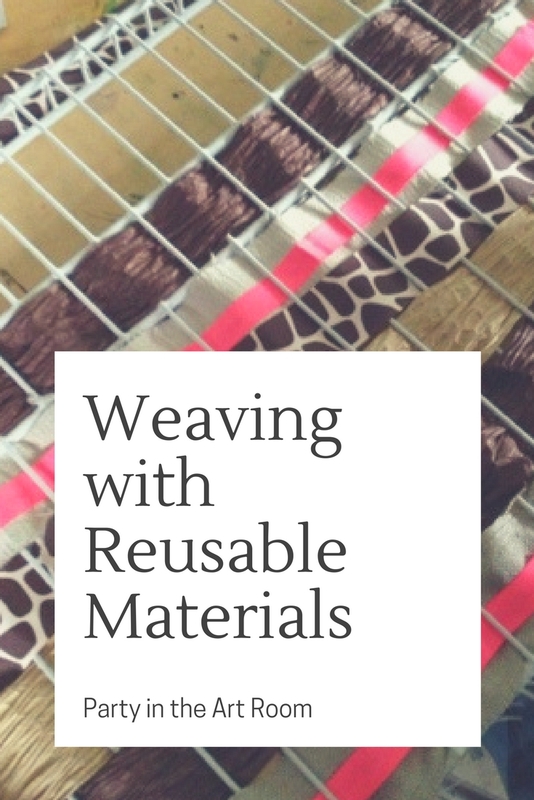 You can weave with all sorts of reusable materials. I replaced the shelving in my pantry, and just couldn't stand to throw out the old wire shelves. It felt wasteful. The only reason we replaced them in the first place was because some of them were broken in places. Although, most were usable as shelving when we bought the house, it was time to replace them. BUT for the most part they were in good condition! Anyway, after driving around with these partially broken, wire shelves in the back seat of my car for a couple of weeks, I had an epiphany! Why not use them as looms for a weaving project? A loom is a frame for interlacing at right angles. These were perfect! I asked my Facebook friends for donations of fabric scraps that could be cut into strips about 2 feet long and 1 inch wide. My Facebook friends always come through for my art students! I received lots of great fabric scraps. Some even donated old (clean) clothing. I added these scraps to the ribbon scraps and yarn that I already had in the art room. 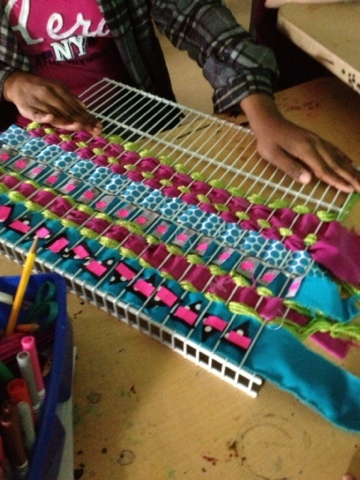 I let students work in groups to devise color themes and combine the fabric, ribbon, yarn, and even some paper to create their own design. 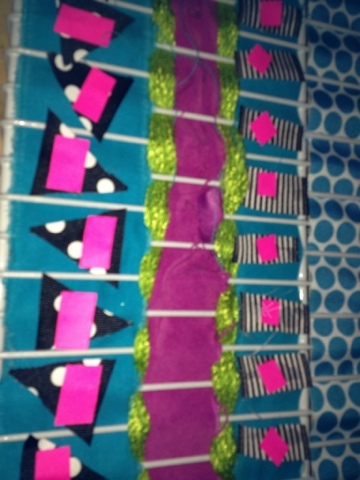 They used glue to combine ribbon and fabric. They took turns in their group weaving the strips into the wire shelving. They took turns holding the shelving while their peers weaved as well. 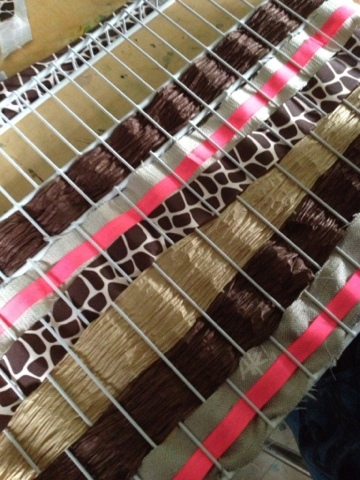 They also used glue to attach smaller details after they were finished weaving. In the photographs, you can see the different parts that make up the whole of this project. 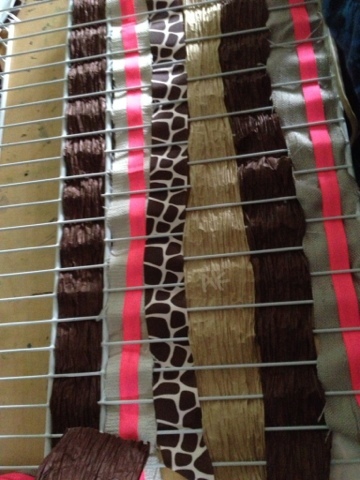 Below, the blue and dark pink areas are strips of the donated fabric. The smaller pink squares are scraps of poster paper. The black parts underneath this are cut up scraps of ribbon. The green is yarn leftover from another project. This was another great collaborative project. In fact, we loved it so much, we are making installing these permanently in our school AFTER they hang in our local art museum for the spring show! Weaving in groups (group work in general) can get a little noisy (okay a lot noisy). 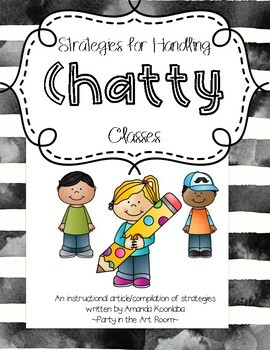 My Strategies for Handling Chatty Classes guide might help. This is a 19 page ebook available in my Teachers Pay Teachers store for only $8. P.S. Want a FREE Weaving Assessment Checklist? Claim yours here! GENIUS!! Love this idea, wow! How did you take them off the wire racks? Great idea and they look awesome. The actual wire part of the shelf in my pantry just lifts out of the brackets that are attached to the wall. We replaced the ones we had and I took the old ones to school. They hang on the wall pretty cool because they have that ledge on them. You can see that ledge in the first individual pic of the turquoise and pink. This is a link to what the shelf looks like at Lowe's. Lowe's will cut them for you. I wonder if someone building a house would have left over that had been cut. You know you have to buy the whole piece and then have it cut to size. So, you end up with some left over. I have so many times just posted on Facebook asking if anyone had any left over building materials. They would tell me what they had and I would just try to figure out how to use it! I know I just told you a bunch of stuff that you didn't ask! I'm not sure if I answered the question. Let me know! Soooo Cool! I love this! It’s looks amazing! Thanks Margaret. What else do you think we could weave with? I am trying to compile a better list.